Can’t get enough of Peranakan cuisine? 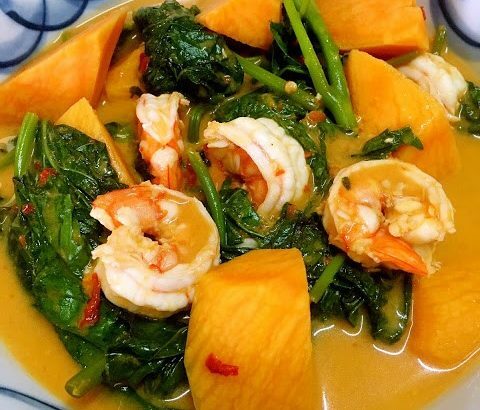 Try this simple and heart warming Nonya dish made with super food sweet potatoes, its leaves and tiger prawns! These much “neglected” sweet potatoes leaves – delicious and affordable and they pack a multitude of health benefits. It is quite similar to another local vegetable – Kang Kong (morning glory/water spinach), only more fibrous. 1. Heat the oil in a wok to fry the spice paste until fragrant. Add the shrimps stock and tamarind peel. Bring it to a boil and add sweet potato, simmer until sweet potatoes are cooked. 2. Add the coconut milk and stir gently. 3. When gravy starts to boil, add in the sweet potato leaves and the prawn, season to taste with soy sauce and sugar. 4. When the prawns turn pink, remove from heat immediately and served. You may omit the prawns and have it totally vegetarian, subsititute prawns stock with vegetables/mushroom stock. Keep the prawns shells and heads to make prawns stock. Do make large batch of sambal paste as this is the base for many delicious nonya dishes.